CURRENTLY READING: Education for Judgment: The Artistry of Discussion Leadership. THE THING THAT DREW YOU TO IT: I have spent a considerable part of my nearly 30-year career trying to enable great teaching and learning experiences for children, and now adults. More than half of those years have been actually teaching myself, the other parts have been as a system leader. Well, I am back in a position of doing it — teaching myself. This book was given to me by my colleague, Josh Bookin, who leads HGSE’s Teaching and Learning Lab. The book is a reminder that great teaching and learning should be a constant pursuit for those who are blessed to hold that title: teacher. FAVORITE BOOK YOU READ TO YOUR BOYS WHEN THEY WERE LITTLE: My wife, Kisha, and I have read so many books to our three boys as they were growing. Chicka Chicka Boom Boom, Are You My Mother? and More, More, Said the Baby. All bring a smile to my face just thinking about them. However, it was when they were around 12, 10, and 8 when we decided that we would have joint reading time as my father once did with me and my siblings. The novel of his choosing: Sounder by William Armstrong. For our sons, we read C.S. Lewis, starting with The Chronicles of Narnia: The Lion, Witch, and the Wardrobe. IF YOU WERE TO GIVE A BOOK AS A GIFT TO SOMEONE, WHAT WOULD IT BE? Trust in Schools by Anthony Bryk and Barbara Schneider. I would give it to every American principal and teacher leader. I think the most important resource for schools to operate well is trust. It’s that simple. When I was a principal, my superintendent gave all principals this book. It made me think about leadership completely differently. EDUCATION BOOK THAT YOU THINK ALL EDUCATORS SHOULD BE READING? As it relates to the critical work of teaching and learning, I am a huge fan of John Hattie’s Visible Learning for Teachers: Maximizing the Impact on Learning. As it relates to addressing inequities in America, I am huge fan of anything Ta-Nehisi Coates writes, such as Between the World and Me, as well as J.D. Vance’s Hillbilly Elegy. FAVORITE SPOT TO CURL UP WITH A GOOD BOOK: I don’t curl up well. Need to be sitting when reading. I enjoy reading in Widener Library or the second floor of The Coop balcony, where the Harvard schools’ crests are lined up. 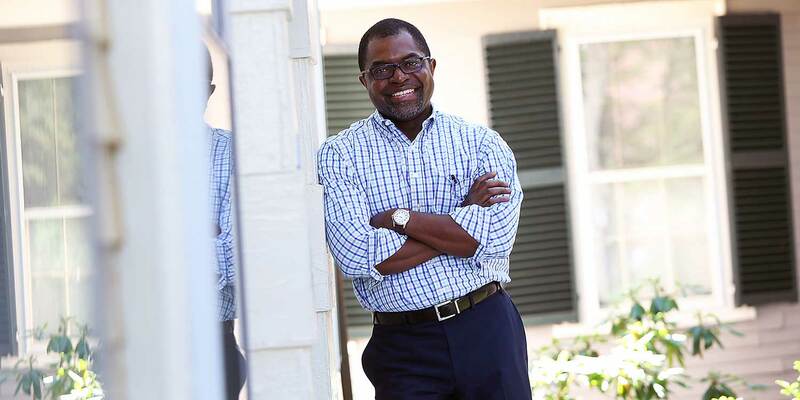 Read more about Senior Lecturer Irvin Scott, Ed.M. '07, Ed.D. '11.